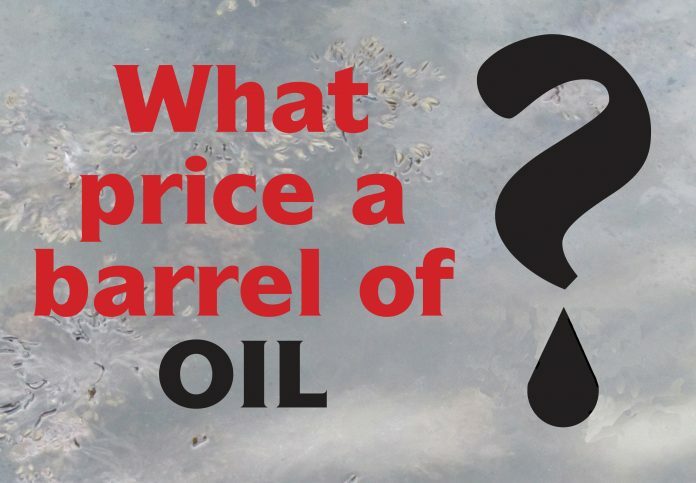 There is a question we are entitled to ask concerning the drop in the oil price: is the fall a rational movement? We all know economists have not yet mastered the ability to tell the future. They work on probabilities based on past trends and analysis of emerging trends and market changes. That nobody was predicting the current trend is borne out by the expectation of oil prices for 2014. Of 18 organisations that work in the field of economic forecasting, 17 predicted an oil price on or above $100 a barrel. The odd one out was Capital Economics who predicted a price of $90. As an Insight Report by Aberdeen Asset Management dryly notes “despite the long queue of oil experts now opining on the subject (none of whom were sharing their insights six months ago, when it might have been useful), no one really knows why the price has almost halved this year. In fairness to this august body of economic opinion, their forecasts were spot on until mid October. There is a body of opinion that ‘Mr Market’ is the one who knows, but nobody knows who ‘Mr Market’ is, or how to gain access to his unique insights. There are times when the market smells blood and this looks to be the most likely explanation, combined with a game-changing strategy on the part of OPEC to drive prices down. Mr Market is given to over reaction, particularly when a commodity price starts to tumble. Sophistication in market price changes sometimes amounts to little more than a child’s game of pass the parcel. I remain unconvinced that a surplus of supply explains such a marked fall to where the price of oil is today, other than being a possible factor in the early falls below $100. Oil has been losing market share against other energy sources for several years. We can plot an upward trend for oil consumption, but other energy sources are taking a larger share of total consumption. The share of energy consumption for oil peaked at around 48% in the early 1970s, dropping to under 35% by 2009 according to Kamiar Mohaddes in his study of oil prices, average costs, consumption and proven reserves. Mohaddes’ paper covers the period 1965 to 2009 so the data input to his modelling lacks more recent and new higher cost discoveries. Based on world consumption levels, he predicted world reserves could last for a minimum of 29.05 years and a maximum of 45.68 years. His mean calculation is 40.32 years. You may have heard a story that has been going the rounds that oil in Scottish waters is running out. Now you know ALL the oil is running out. The BP Statistical Review of World Energy 2014 includes more recent data and calculates production and consumption levels are sufficient to last 53.3 years. Global proved reserves have increased by 27% in the last decade. The largest share of reserves to production ratio is in Central and South America. This table shows the change in production and consumption figures for both oil and gas for 1990 and 2013. Both production and consumption have grown over this period, in line with increased global energy demand. If we set the 1990 base at 100 the production figure for oil in 2013 is 132, or one third more. For gas production in 2013 the equivalent figure is 168, or a two-thirds increase in output and consumption since 1990. Gas therefore has been gaining market share from oil over this period. But oil remains a major source of world energy. Did something suddenly happen in the autumn in 2014 that upset the balance of the supply and consumption of oil? Are refineries holding massive reserves the market is not buying? Have governments and others started stockpiling to take up a glut? Are bunkers at the main oil distribution ports overflowing? Are refineries taking in lower crude supplies? If all this had been happening on a major scale, then that might explain the massive price drop. But as reports would have leaked out we have to look for rational explanations elsewhere. The last time we saw a major oil price drop was during the financial crisis in 2008, but economies are growing again even if the rate of recovery is slow. The US economy is growing at 5%. As the US accounts for 20% of world oil consumption, a closer look at energy consumption in the US should give us some indication of the prospects for the oil price going forward. Oil is the dominant fuel source in the US with a 49% share. With a trend in re-shoring of industry back to the States, industrial demand for oil should continue to strengthen. 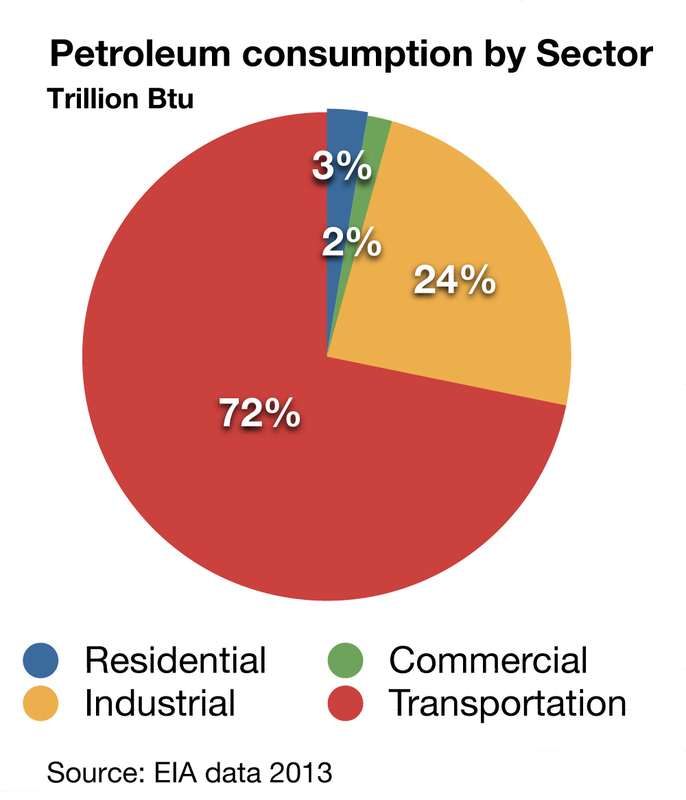 The big petroleum user is the transport sector, including private households. Analysis by sector provides a very clear picture of where the demand for oil is concentrated. Transportation consumes 3 times as much as industry. With the advent of fracking the US now produces 80% of US oil demand. The US energy market is still heavily oil dependent. US oil consumption today at 49% is at odds with Kamiar Mohaddes’ analysis that global dependence on oil in the energy mix had fallen from 48% to 35% by 2009. American oil demand represents a bulwark, supporting demand and the oil price in the long term. We cannot assume that sector consumption patterns in the UK and Europe follow identical paths, but a degree of correlation is likely. 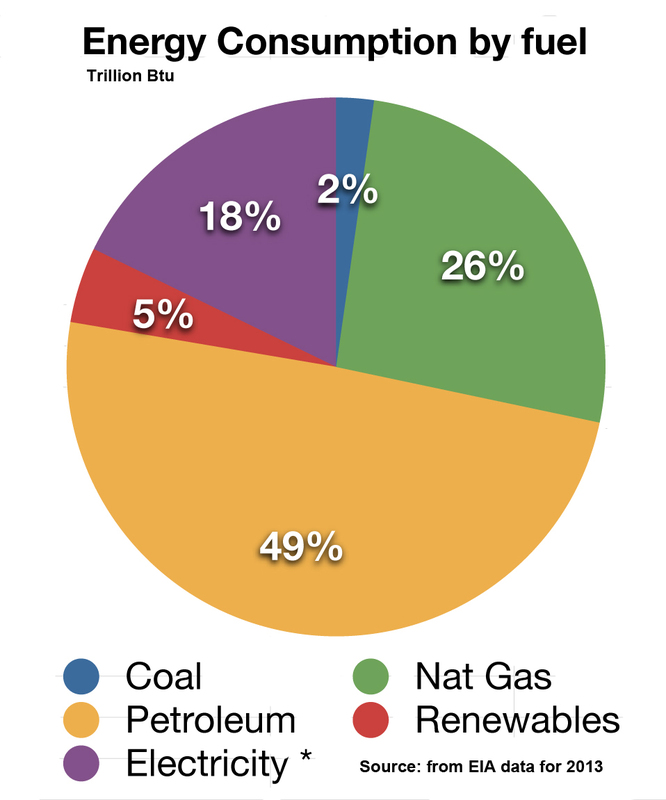 The Scottish Government in its annual publication, Energy in Scotland 2014, breaks down energy consumption differently – Heat 55%, Transport 24% and Electricity 21% from all energy forms, including renewables. 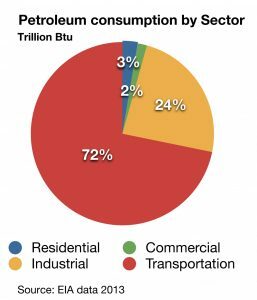 From total US energy consumption of 70,783 Trillion btu we can calculate the share of petroleum allocated to transportation (25,079 btu) which gives us 35% of energy consumption allocated to transportation in the US. Industry accounts for 12% with residential and commercial sectors taking the remaining 2%. Given longer travel distances and much higher levels of car ownership in the US, the lower percentage in Scotland at 24% is not unexpected, yet it is still a substantial share of energy consumption. Private cars account for a large share of petrol and diesel consumption and upward trends globally provide a clear indication that demand is set to increase despite more fuel-efficient engines. Car ownership in the US runs at 800 vehicles per 1000 people. In Europe it is around 500 per 1000. Car ownership in China is only 80 cars per 1000 and in India it is 25. These figures hide a change, taking place in both these eastern countries. China now produces more cars than any other country. The Chinese are making 20 million cars this year and production is set to rise to 22 million next year. Car production in India is up 16%. More cars and rising air travel miles means higher fuel consumption. The pace of growth can only accelerate in these countries with a growing middle class anxious to catch up with the West. New car sales in the UK rose 9.35 % in 2014 compared with 2013. In the US lower fuel prices are enticing buyers back to Sports Utility Vehicles and other high fuel consumption models. Americans having suffered a period of ‘gas austerity’, driving smaller more fuel-efficient cars, may be about to revert to their beloved gas-guzzlers in the wake of falling forecourt prices. Against this background it is difficult to see fuel demand not forcing oil prices back up, even if there might be a bumpy ride in the short term. Supplies from the Middle East will continue to have short-term price implications. The Saudis have cut prices to Europe. Iraq is re-establishing its oil industry and Iran will pump out more oil to gain revenues when sanctions are lifted. We are simply not facing anything like the conditions of the 2008 financial crash that caused the last major oil price fall. The number of cars in the world passed the 1 billion mark in 2010 and the OECD has calculated that the number will rise to 2.5 billion by 2050. To keep these vehicles moving, at a time when current proven reserves will be all but exhausted, would require an 45% increase in daily oil production. These figures don’t add up against present projections of global oil reserve exhaustion. Added to the number of cars on the world’s roads are vans, buses, commercial vehicles, road freight and SUVs. Competing for available fuel are airlines, world shipping and military fuel consumption. The growth in air travel is showing a constant rise in demand for aviation fuel. Global jet fuel consumption in 1984 amounted to 1,840,230 barrels a day. By 2010 it had risen to 5,201,410 barrels a day. Electric cars and hybrid solutions will no doubt start to make an impact, but replacing everything on our roads today with embryo technology solutions will come much later than higher oil prices. UK inflation: is there a point to the Government’s inflation target?